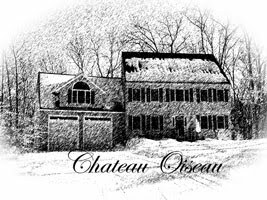 Chateau Oiseau: Update on the 2009 Pinot Noir! Well, today was the day to rack the 2009 Pinot Noir again, having spent three months settling out. Once it was off the lees, I used up the rest of my "spare" jug to top it off, so now I'm down to just one single 6 gallon carboy. I also added the medium toast oak cubes--an alternative to oak barrel aging. The fact is that for a home winemaker, using real oak barrels presents issues. 1. You need to keep them full all the time or they dry out and leak. If you are only doing a batch or two a year, this can be tricky. Some people fill them with water, but the water leaches out the oak flavor, which is the whole reason you use the oak in the first place. 2. They require cleaning in between uses--which can be a pain without the right equipment. 4. Small barrels, suitable for the amount of wine the average home winemaker produces (5 to 15 gallons) have a lot of surface area in comparison to their volume. As a result, in newer barrels, the wine takes up too much oak flavor if it stays in the barrel too long. So you put the wine in the barrel for a month or two, then it has to go into something neutral (a glass carboy). Now what do you do with the empty barrel? See #1 above. While the high-end winemakers still use oak barrels (French oak for the most part), many of the less expensive brands of wine simply cannot afford to use oak barrels and keep the price of the wine down. Virtually all wines priced under $10/bottle retail are not aged in oak but in stainless steel. The oak flavor comes from chips, cubes, or powder. These days, the oak infusion spiral is gaining popularity with home winemakers. It's what I will probably use for the next batch. At this point, I am likely done racking this cuvée and it will stay in this carboy until the fall when it will be bottled. In Burgundy, it would age in barrel another year--they would be bottling the 2009 sometime in 2011, not 2010. But alas, I have limited space and by the fall I will have more grapes coming in. Time to start thinking about a label design I guess. Speaking of grapes coming in, I have been told that my shipment of Chilean grapes will be here in about 2 weeks. The nice thing about the southern hemisphere grapes from the perspective of a home winemaker is that the seasons are 6 months off from the northern hemisphere. So I can make some wine in the fall from northern hemisphere grapes, then another batch in the spring from the southern hemisphere grapes! So have 120 pounds of Chilean pinot noir and 120 pounds of malbec on the way--to make about 7 gallons of each wine. :) Should be fun!